So, now that it’s March, that means that the Cherry Blossom Ten Miler is about six weeks away! It occurred to me that I should come up with some type of training plan. I’m not trying to PR Cherry Blossom but I do want to have a strong race. 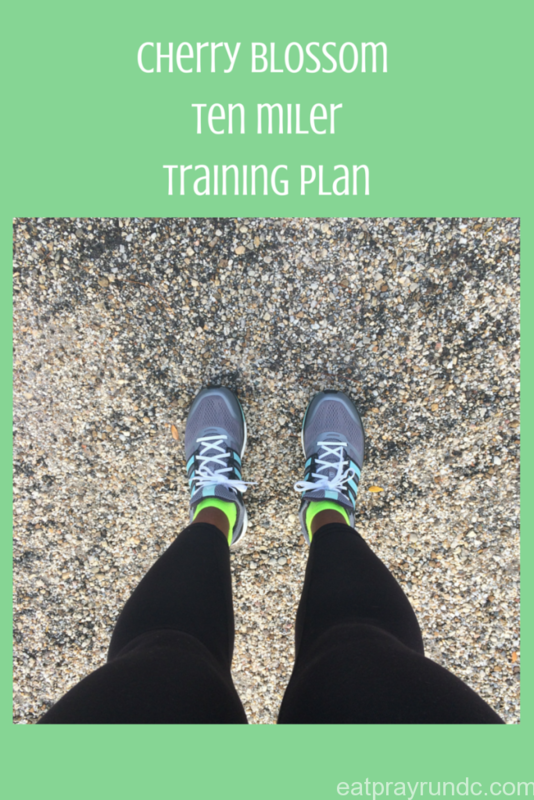 I worked backwards from race day to come up with a plan that kept me at 3-4 runs a week (which will give me time to start swimming hopefully, and of course Pure Barre). It’s pretty laid back and my goal with Cherry Blossom is to just build up mileage. I want to be at a steady 20ish mile a week base before I start marathon training this summer. Week 1: This is week 1. I’ll run 3 easy runs and a DC Road Runners 10k on Sunday morning. I won’t be racing, just using the race to get some mileage in. Week 2: 3 runs, one incorporating fartleks and a weekend run of 4-6 miles. Week 3: Two weekday runs plus a weekend trail run with my local Oiselle team gals. Super exciting! Week 4: Four runs total, with the weekend run totaling 8 miles. Week 5: Three runs, with the weekend run a 90 minute trail run with Potomac River Running. CB Week: two easy runs, and then RACE DAY! The weekday runs will range from 3-5 miles and for the most part be easy with some speedwork thrown in depending on how my shins and ankles are feeling. I plan to add in some morning swims soon, too! Plus, of course Pure Barre (lots of Pure Barre) four to five times a week. I am excited to see how the race goes even with my more laid back training plan. I’ll be recapping my progress on the blog so stay tuned to see how my laid back, self designed training plan for Cherry Blossom goes! Looks like a good plan! I’m starting to do speedwork this week, I’m in Week 6 of training now for the Cherry Blossom. I hope we’ll be able to meet!! Good luck! I think of the Cherry Blossoms like Texas Blue Bonnets. When I see them, I know spring is officially in season. i’ve always wanted to run cherry blossom, but never have. maybe next year! i love the 10 mile distance and this is a fun race! Your plan looks great, especially since you are not planning on a PR attempt. You are very lucky to have so many local races to enjoy on the weekends. Running a 10k for fun as part of training is a nice option for your long run this weekend. yeah i kinda forgot about the 10k until a couple of days ago, lol! looks like a great plan. Always one of my favorite races. I didn’t get in this year for the first time in 5 years. Prob good bc I still haven’t really been able to build my mileage back up yet with the foot thing. Happy training! oh, sorry you didn’t get in! boooooooo 🙁 and also boo to your foot still giving you trouble. lame. Sounds like a great plan, Courtney. Hopefully I’ll see you on race day! Kathryn @ Dancing to Running recently posted…Wine and Dine, Here We Come! Not running anything yet 😉 but it sounds like you have a solid game plan written down! I like how you worked backwards from race day to plan your training. I have found that is a great strategy to help me reach my goals. yeah working backwards works well for me to plan out long runs and then go from there! I’m not but I wish I was! I didn’t enter the lottery this year because of my April race. It’s definitely on my list though and the plan you have set up sounds solid! 😀 Good luck with your training, lady! Great plan! I am working my way up to a mileage increase as well to start training for my fall marathon. awesome – what is your fall marathon? I know you really enjoy this event, Courtney, so I’m just glad you’ll be able to participate! I think you’ll do great; I’m with you, though…I feel better when I have a plan – ha! 😉 Can’t wait to hear all about it and you get closer to the race! Sounds like a great plan to me! You already have a great base, so you will do just fine! i’m bummed too but i know it’ll happen sooner rather than later! Good luck! That must be a beautiful race, I’ve seen pictures of the cherry blossoms in DC and they are just so gorgeous. Your plan looks great! Cherry Blossom doesn’t work for me, but I just saw your St. Charles post and I totally might do that one!!!! Jen@milesandblessings recently posted…My husband’s first trail ultra!!!!!! i hope you do!!!! keep me posted if you do! I plan on something similar so thanks for the reminder! I’ve got Chicago in the fall and training will start in the summer–I’d like to have a good base before training starts for that. Especially since I don’t have any “big” races lined up anymore. Am looking forward to following your training–what marathon do you plan to do? This post made me smile because it made me think there will be cherry blossoms in 6 weeks! Seeing the blossoms in DC is one thing I’ve always wanted to do, so I would love to run this race! Looking forward to seeing how your plan works out. You should come to dc and visit. It’s a beautiful time to come!! I’m sort of winging it, but trying to run 3x per week and do some speed work. that sounds like a good idea – you’ll be totally fine with your base! I lived in D.C. for one year…the cherry blossom time was the best…..
BTW, I used your how to start a blog post to start my own run blog! Karen @karenlovestorun recently posted…Why Treadmills Aren’t THAT Bad! This looks like a great plan to start building your base and still fit all those barre work outs in! Good luck! This looks like a solid plan! Please let me know what your weekday runs look like for the week of March 30. I would love to run with you! Looks like a good plan. Ill email you when I go swimming!